We left St Katharine’s at 06:00 with a lovely farewell from Emma & Tim, Paul from Double Dutch and a wave from Kat from Baleen. The weather was lovely with some much-deserved sunshine at last. We needed to get stocked up with fuel so made a quick stop at the fuel barge. Unfortunately the staff did not turn up until 06:45 so we had to wait for an hour, which meant an hour less of tide to push us down the Thames. 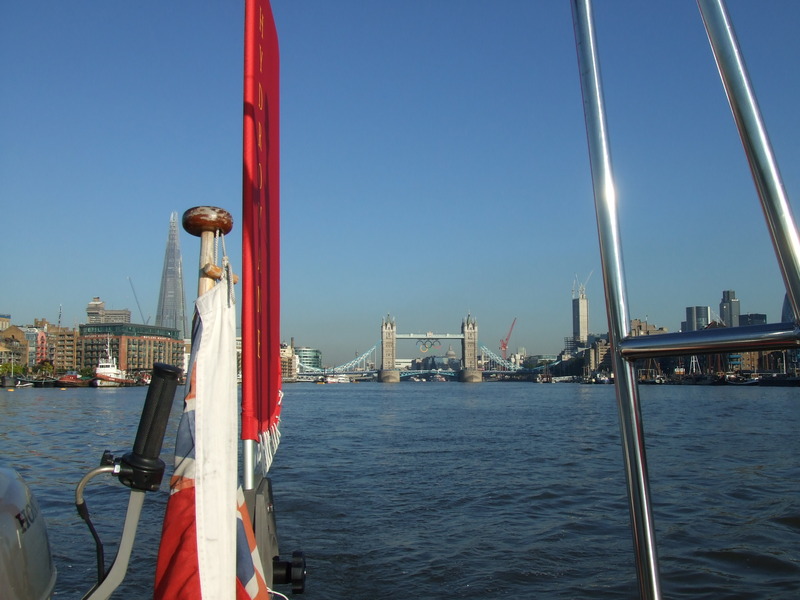 We finally set off at 07:10 and with no wind to speak off it was a slow sail down the Thames but at least it was not raining. I would like to say that I was sad to look back at Tower bridge and leave London behind but I was not and although it has been a great home to us for the past 18 months it was certainly time to move on. We had a pleasant motor down the Thames, nothing out of the ordinary occurred although we have a small vibrating noise coming from our stern gear that will need to be lucked at. We arrived in Queenborough at 13:00. Now we have to wait for the time to turn before we can set off over to Ramsgate.